This Victorian watering hole has adopted a trendily ramshackle yet comfortable character. Visitors are made to feel as if enjoying a night out in their own living room. A stone’s throw from Goldsmiths University, it effortlessly blends old-school pints with uber cool music and comedy nights: Alt-J, Bombay Bicycle Club, The Vaccines, Carl Barat, Bloc Party, Dave Rowntree (Blur/Xfm), Primal Scream, Mystery Jets, Maximo Park, The Cribs, The Coral, and Terry Hall (The Specials) have all been down to spin their favourite tunes. Happy Mondays are a long-established fortnightly comedy event, where the well-known comics honing their material have included Stewart Lee, Cardinal Burns, Russell Howard, Shappi Khorsandi, Andy Parsons, Andi Osho, Arthur Smith, Sarah Millican, Greg Davies, Milton Jones, Dane J Baptiste, Robin Ince, Sean Walsh, Al Murray. 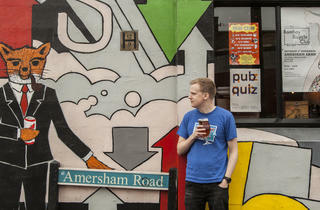 The Amersham Arms also hosts film and poetry evenings, and offers space for exhibitions. Not gonna lie, this place gets ROWDYYYYY when gigs or DJ sets are on, but that's what I love about it. I've never had a problem with the bar staff being rude. Drinks are on point, the music is always good and there is eye candy galore. What more do you need from a night on in New Cross?!! So glad to see this venue become vital again. Goldheart Assembly, Toy, Loom, Russell Howard, Holly Walsh, Bare Pale and just recently a low key show by Jamie N Commons, to name just a few, in the last year alone. Nice mix of students, locals and art crowd so its friendly as well. That will do nicely for me with a long cool pint in the evening. And just a short hop over the road from the East London Line, too. Bonus. Really awful place. Rude staff, including the manager who treated two of our party disgustingly! There are plenty of nice pubs just around the corner if you're looking for a good night out, this isn't one of them! Came one Thursday night to listen to a bit of live music. The pub is nice and gets busy pretty quick, great atmosphere! The venue was free of access which was great! I love this pub. Amazing music awesome smoking areaI Perfect on a chill week night or busy and exciting for a late one on a weekend! Nice venue. Trendy, always here to see some exciting up and coming bands. The Velvet Hands and River Greene were a particular highlight. out the back, good variety of music in both. 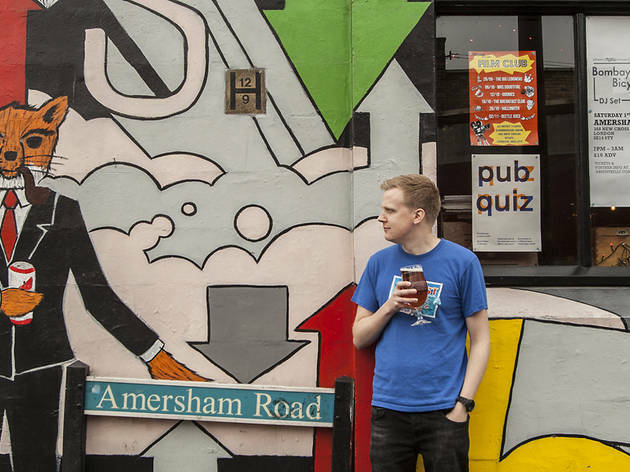 What can you say about the Amersham Arms, except AWESOME. It’s such a great bar, with a great atmosphere, great music and decent choice of drinks. The bar staff are very attentive and polite and also have a sense of humour. The manager is top class, he is at the front of house and very welcoming, very personable guy. The door staff are first class, really friendly funny guys who you can actually talk to rather than being mute statues looking menacing like other venues have. The club nights the Amersham puts on are really fun and always have a good party atmosphere. This is a bar that offers a good choice of environment as well, whether its mingling on the awesome garden with several balconies/decking areas to see the city lights, or the front bar where it can get busy but that just adds to the atmosphere in my opinion or if you want to have it large, head out to the back club part of the bar to dance the night away. This is my favourite bar in south east London and it has been for many years and, just like a fine wine, just keeps getting better. Well done Amersham, keep it going. As a girl closer to 30 then I really want to admit, I've been going to the Amersham longer than a line for the latest pop up in Brixton. The Sham has always held a special place in my heart and its great for those drunken nights when you haven't quite had enough jagerbombs to even go near The Venue - two nights are never the same from Old School Indie usually in the front bar and in the back live bands, RnB, Garage, jungle, some stuff that I don't even know what the hell it was. With £5 double rum and cokes and a strange Guantanamo Bay type smoking area/beer garden you can't have a better or dirtier night out. Best comedy nights in London which are good value for money as well. Pretty great multi-function pub with big student crowd so can be a bit hectic (but normally in a fun way, if you're in the mood for a party). Bit of an institution for the early twenties Goldsmiths set, still ringing the indie disco bell at the weekends and with gigs though out the week (you gotta respect that). The space itself is massive with various rooms at the back and upstairs used for markets and larger events sometimes. Theres a room you can hire upstairs for free too which is handy if you want a bigger group/party. Staff can be a bit moody but it sort of fits with the venue (like, you can pick up a copy of Vice here y'know?). I actually really like this pub on quieter afternoons, the food is good and the booths are big enough to spread out with newspapers. So so close to the train station too so you can down a pint if the trains are delayed! South East London has a really cool live entertainment circuit and this is one of the venues that I keep finding myself in, catching some wicked gigs. Friendly with lots of laughter, too. Does it for me. The Brockley Ukulele Group play their Ukebox of over 60 songs on the second Sunday of every month from 8pm. I'm definately going next time. They are amazing. I especially love their version of Daft Punk's Harder Better faster Stronger. Best night I've had out in ages!! !